Fishing is a lot of fun, but it requires being near or in water. There is always a risk of falling into the water. And whether or not you know how to swim, a good fishing life vest is mandatory. Otherwise known as personal floatation devices (PFDs), these vests are designed to provide a snug fit and help keep you afloat in water. They leave plenty of room to fish comfortably. While they don’t necessarily ensure you survive, life jackets indeed reduce the risk of drowning. If you are having a hard time choosing a life jacket for fishing, this post will get you started. 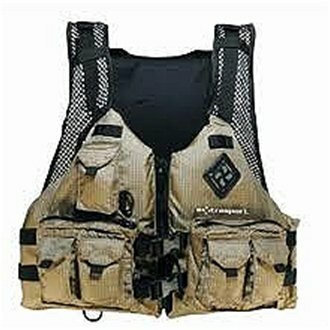 These vests are ideal for remote water, open seas, and even rough seas. They are a good option if you plan on fishing in locations where rescue may be slow coming. Foam variations are bulkier compared to inflatable ones. Offshore life vests offer the best buoyancy and often include a reflective tape for visibility at night. They have bright colors and are capable of turning unconscious users face up in water. Inflatable variations provide 150 Newtons of floatation while foam types offer 100 Newtons of floatation. It’s worth noting that there is no Coast Guard approved Type I inflatable vests. 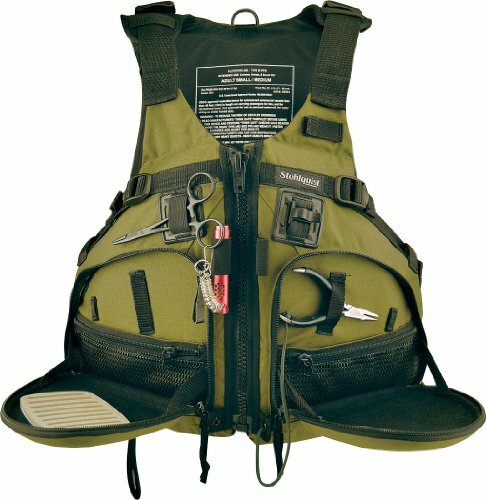 Type II vests are designed for calm waters where the chances of quick rescue are high. Most are capable of turning unconscious users to the face-up position. They are generally comfortable, and less bulky compared to Type I. Foam and inflatable types provide 70 Newtons and 150 Newtons of floatation respectively. Foam types are usually stowed on boats to ensure USCG compliance while Inflatables offers better floatation and comfort. 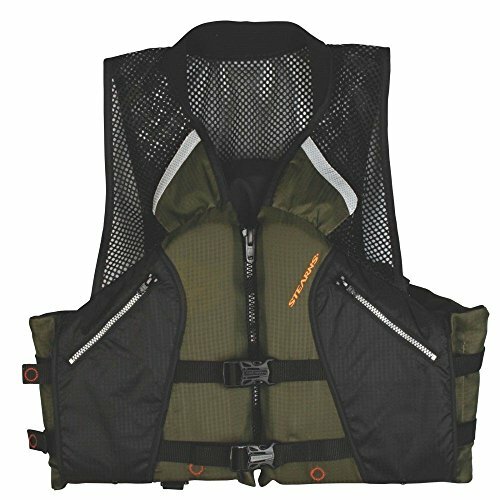 Category III vests are best suited to anglers when there is a high chance of quick rescue. They are the most comfortable of all types, mainly because they provide plenty of freedom for movement. These vests are designed such that users have to put themselves in a face-up position. With inflatable Type III vests, users float with the head tilted backward. They provide 100 Newtons of floatation while foam Type III's provide 70 Newtons of floatation. Ring buoys and boat cushions fall under this category. They are thrown to individuals in trouble and serve as a backup to a personal floatation device. These devices aren’t suitable for rough waters or anyone who doesn’t know how to swim. Boat cushions provide 82 Newtons of floatation while ring buoys provide 75 pounds of floatation. As the name suggests, these vests are designed for specific activities and have to be approved by the USCG (United States Coast Guard). Varieties include deck suits, kayaking, fishing, windsurfing, skiing, and even hybrid vests. Sailing inflatable vests come with harnesses while over-the-head entry foam jackets are ideal for sailing in dinghies. Jackets in this category provide 70-100 Newtons of floatation and 100-155 Newtons of floatation depending on whether they are foam or inflatable types. They are usually labeled Type V with Type III performance or Type V with Type II performance. Brightly colored vests with reflective material make it easy to be seen, especially in the dark. A good life jacket should be capable of keeping your head afloat. This is helpful when it comes to keeping unconscious victims breathing. This is particularly important when taking a child out on the water. An adult life vest on a child will never provide ample protection. Adults and children alike need an appropriately sized jacket not only for safety reasons but also for comfort. A high back panel provides extra comfort, especially when kayak fishing. Consider panels with mesh if you intend to fish on sunny days. This is one of the most essential features of a life vest. A buoyancy rating of 35 pounds is recommended for offshore areas. Expert anglers fishing in bays can get away with 22-30 pounds of buoyancy. Pricier vests offer plenty of storage in the form of internal and external pockets, as well as D-rings for clip-on accessories. The downside is that some offer these features at the cost of comfort. However, the pockets offer access to emergency supplies when stranded. Think about the gear you want to put in them, and how the pockets are placed. 500 dnier cordura shell & 200 denier oxford liner. 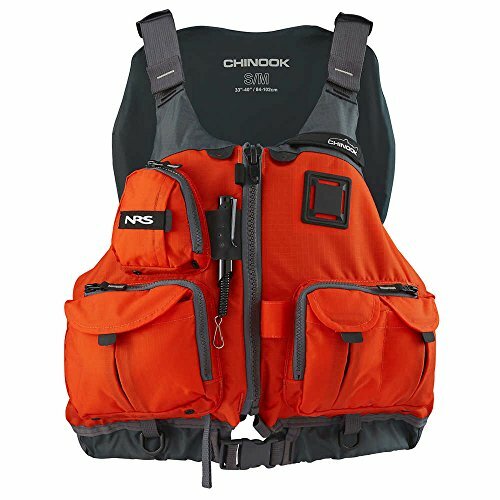 The Chinook Fishing PFD by NRS is one of the most comfortable life vests for anglers. It is a Type III vest that offers 16.5 lbs. The PFD is made to last long with 200 denier urethane coated ripstop nylon. It comes in three sizes and features seven front pockets. There are eight adjustment points that ensure a comfortable fit, regardless of your size. The pockets and D-rings offer safe storage for accessories. They also make it easier to fish from small boats. This PFD has a breathable design and offers plenty of ventilation. It features a mesh lower back that provides added comfort on high back seats and improves ventilation. The soft PlushFit foam floatation conforms nicely to the angler’s body for maximum comfort. There is a coil tool retractor that allows users to clip on small accessories like forceps. The strobe holder loop comes in handy in low light conditions. Stohlquist is a name that most anglers recognize instantly. All creativity tricks went into making their Fisherman Personal Floatation Device exceptional. It has two large pockets on the front with attachments for pliers. Both have inner mesh pockets to storage customizability. The PFD offers plenty of comfort with adjustable shoulder and side straps, which allow a snug fit for people of different sizes. It has a high back mesh panel design provides improved comfort. It also allows for better ergonomics, especially when kayaking. The jacket is built using 500 denier shell and has a 200 denier oxford liner to ensure durable and waterproof performance. It comes with neoprene padded shoulders and a lower back waistband for comfort and support. The open sides allow for ventilation on sunny days. Overall, this PFD is a great asset and satisfies a wide array of needs. Next up is the Onyx MoveVent, a perfect life vest for short recreational paddling trips. It comes with a mesh lower back that allows for a snug fit while improving overall ergonomics. Locking the jacket in place is easy thanks to the two lateral adjustment straps. These straps help prevent the PFD from rising up and compromising user safety in the water. Durability is guaranteed with 200 denier nylon ripstop and nylon oxford construction. Being a US Coast Guard Type III Life Jacket, it certainly provides optimal protection. It uses lightweight, soft foam floatation and the reflective grade material offers improved visibility at night. The zipper base has a zipper loop, and a safety whistle for signaling rescuers is attached. 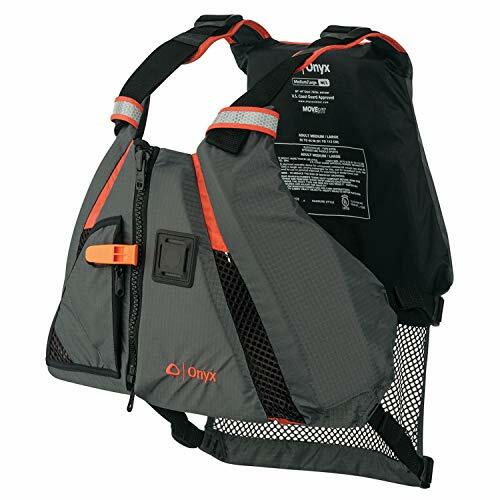 The ExtraSport Osprey PFD for canoe and kayak rafting features multiple front pockets for storing all of your tackle. Its foam/mesh design is achieved with a comfortable GlideFit foam body and mesh shoulder panels. The front zip along with dual buckles ensures a secure fit. The shoulder and side straps are completely adjustable, hence a comfortable fit for people of different sizes. This Type III USCG offers 15 pounds 8 ounces of floatation. It is solidly constructed with 300 denier ripstop nylon and is UL/USCG certified. It has seven expendable gear pockets for all of your fishing necessities. There are multiple attachment points as well as a shell casing holder for a small motor kill switch and other accessories. If you want a lot more than breathability and storage, the Stearns Comfort Series Collared Angler Vest will prove a good purchase. It is designed with dual zippered pockets for holding small accessories and keeping your hands warm. The mesh at the shoulders allows for extreme ventilation while the neoprene collar minimizes chafing. The armholes are generously sized for an increased range of motion. This jacket is made to last for years with a 200 denier nylon oxford shell, PE foam back and PVC foam front. There are two buckles with adjustable 1-inch webbed straps. Because it is US Coast Guard approved, this would be a great life vest for boat or shore-based anglers. You can carry plenty of accessories, and not worry about compromised safety in the event of an accident. If you are looking for a fishing life vest, you should arm yourself with all the information you need to go out there and buy the best. There are plenty of factors to consider, including the type of fishing you’ll be doing. For instance, a vest with more pockets is best for small vessels with little room for storage. US Coast Guard approval is a must, as this ensures ample buoyancy and safety features. All of the jackets reviewed in this post are quite functional, but their characteristics vary. While it is not compulsory, wearing a life jacket on a kayak or SUP makes sense and provides more safety. Hope this guide helps you find the best fishing life vest for your needs.